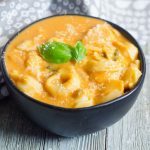 Creamy tomato basil soup with tortellini’s made easily in the instant pot. Add in onion and garlic to the instant pot and set to saute mode. Cook for 2 minutes. Turn off saute mode. Add half the basil leaves and the can of tomato sauce. Set to high pressure for 2 minutes. Quick release pressure when instant pot is done counting. Set to saute mode and add tortellini’s. Cook for about 5 to 7 minutes until tortellini’s are tender. Pour in whipping cream and stir. Cook for another 2 minutes till thick and creamy. Additionally, stir in the fresh basil and pepper. You may top with fresh basil and parmesan cheese.